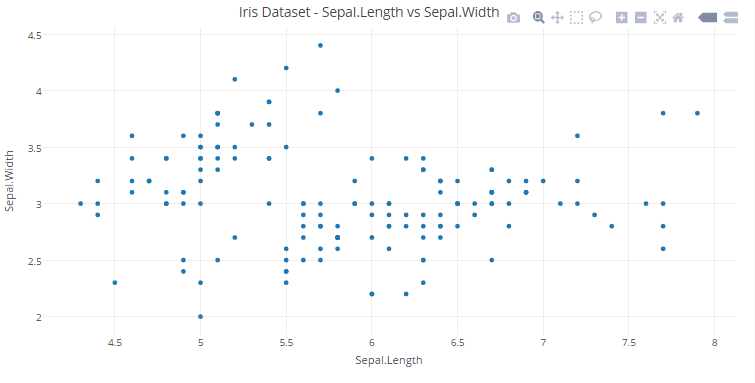 How to create Interactive data visualization using Plotly in R / Python? Home Python How to create Beautiful, Interactive data visualizations using Plotly in R and Python? How to create Beautiful, Interactive data visualizations using Plotly in R and Python? Data visualization is an art as well as a science. It takes constant practice and efforts to master the art of data visualization. I always keep exploring how to make my visualizations more interesting and informative. My main tool for creating these data visualizations had been ggplots. When I started using ggplots, I was amazed by its power. I felt like I was now an evolved story teller. Then I realized that it is difficult to make interactive charts using ggplots. So, if you want to show something in 3 dimension, you can not look at it from various angles. So my exploration started again. One of the best alternatives, I found after spending hours was to learn D3.js. D3.js is a must know language if you really wish to excel in data visualization. Here, you can find a great resource to realize the power of D3.js and master it. Today, I am going to tell you something which will change the way you perform data visualizations in the language / tool of your choice (R, Python, MATLAB, Perl, Julia, Arduino). 2. 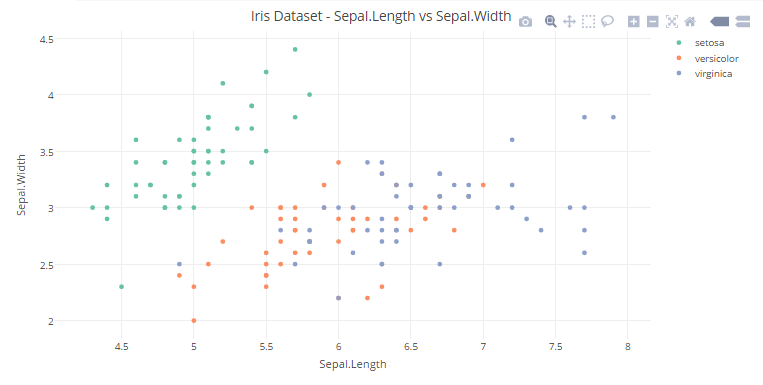 Advantages and Disadvantages of Plotly. 3. Steps for creating plots in Plotly. Data visualization is an art with no hard and fast rules. Getting the data to be used for creating visualization and preprocesisng it to convert it into the desired format. Calling the plotly API in the language/ tool of your choice. size= values for same length as x, y and z that represents the size of datapoints or lines in plot. type = to specify the plot that you want to create like “histogram”, “surface” , “box”, etc. mode = format in which you want data to be represented in the plot. Possible values are “markers”, “lines, “points”. color = values of same length as x, y and z that represents the color of datapoints or lines in plot. 4. Adding the layout fields like plot title axis title/ labels, axis title/ label fonts, etc. Since R and Python are two of the most popular languages among data scientists, I’ll be focusing on creating interactive visualizations using these two languages. You can get International airline passengers dataset here . You can get International airline passengers dataset here. You can view the interactive plot here. 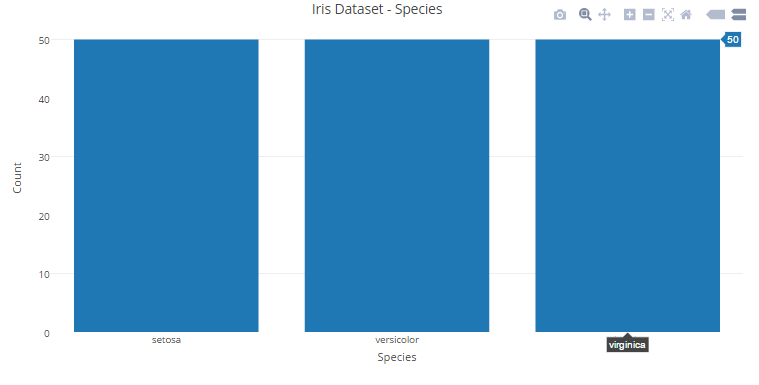 Let’s start with a simple scatter plot using iris dataset. Let’s go a step further and add another dimension (Species) using color. 2. We can add another dimension (Petal Length) to the plot by using the size of each data point in the plot. Till now, we have got a grasp of how plotly can be beneficial for basic visualizations. Now let’s shift gears and see plotly in action for advanced visualizations. ggplot2 is one of the best visualization libraries out there. The best part about plotly is that it can add interactivity to ggplots and also ggplotly() which will further enhance the plots. For learning more about ggplot, you can check out this resource. Let’s better understand it with an example in R.
8. Different versions of Plotly. Each of these versions is differentiated based on pricing and features. You can learn more about each of the versions here. The community version is free to get started and also provides decent capabilities. But one major drawback of community version is the inability to create private plots that to share online. If data security is a prominent challenge for an individual or organisation, either of personal, professional or on-premise versions should be opted based upon the needs. For the above examples, I have used the community version. After going through this article, you would have got a good grasp of how to create interactive plotly visualizations in R as well as Python. I personally use plotly a lot and find it really useful. 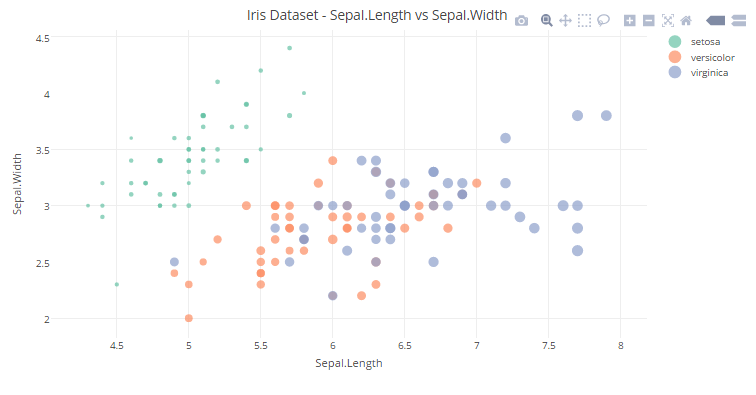 Combining plotly with ggplots by using ggplotly() can give you the best visualizations in R or Python. But keep in mind that plotly is not limited to R and Python only, there a lot of other languages/ tools that it supports as well. If you have any questions / doubts, do let me know in the comments below. If you enjoyed reading this article? Do share your views in the comment section below. Welcome 2017 – Are you prepared for a year of data based disruption? The plots are no longer visible. Your plotly subscription might need a revisit. The problem has been fixed. Thanks for your concern. got to know a new variety of visualization technique much simpler and easy to execute. Very good article Saurav. 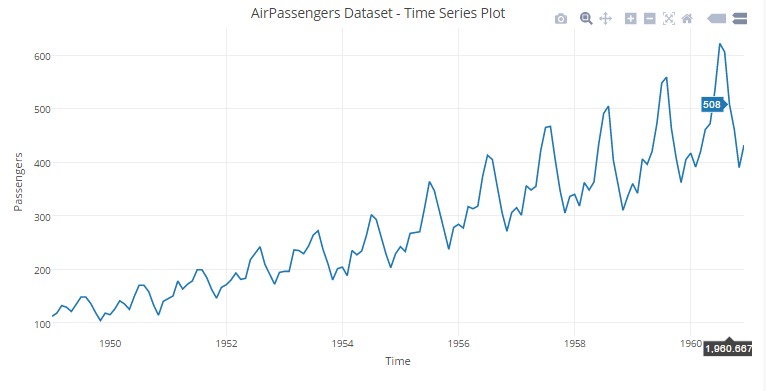 In fact last week I was asked to plot a timeseries data using plotly. But I refused and did it using ggplot2. But looking at this it seems plotly graphics are very good looking compared to the one’s done with ggplot2. Can you please include a plot that shows placing text in between of the plots using a time series data. 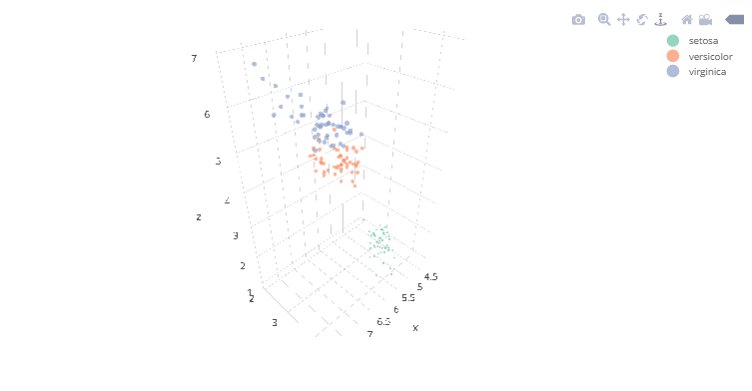 I also feel that plotly is comparable if not better than than ggplots. In fact, why now use the best of both by adding interactivity to your ggplots by using ggplotly() of plotly as I mentioned in this article. Thank you. I believe, this article itself is sufficient to get started with plotly in whichever language you prefer: R or Python. In this article, one can learn from the generalized syntax for plotly in R and Python and follow the examples to get good grasp of possibilities for creating different plots using plotly. You can also refer to the official plotly site for more examples..
Hi Yash, great information! Thank you. Thank you for this awesome article. Is there any way we can get article in pdf format. Thank you but unfortunately the article might not be available in pdf format. My suggestion to you will be to bookmark this article instead for future reference. Thanks for your quick response. Could you please let me know where do we can find bookmark option. If you are using a laptop or computer, you can simply press Ctrl/Cmd + D on the webpage to bookmark it and if you are using your cellphone browser you might need to go through the options/menu to find the bookmark option once you are on this webpage. Thanks,Saurav,. I was thinking like some other way to do this. I want to ask that currently I m doing CSE and doing specialisation in BA but I don’t know how to start course in BA? can you suggest me some options!! Very Nice article Saurav. Do you have an example of using a background image in a plotly Plot in R ? I believe it is the ‘Images’ property of the layout. I just don’t know how best to use it. 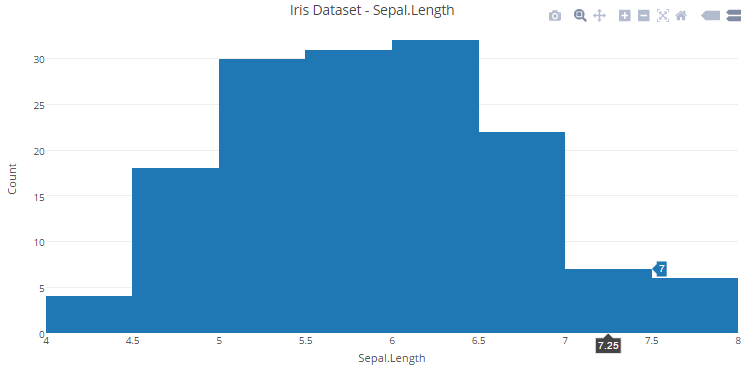 Basics to plotly visualization in Python.